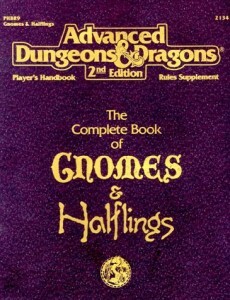 The Complete Book of Gnomes and Halflings is probably not a book you would expect me to love. 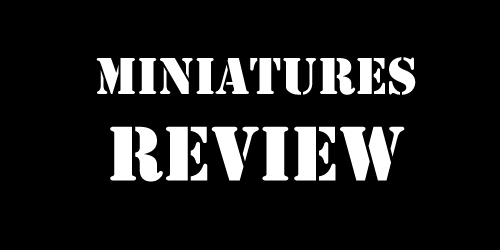 My favorite setting, Dark Sun, renders halflings as cannibalistic little monsters. There are no gnomes in Dark Sun. I generally prefer sword and sorcery to high fantasy. I hate elves. 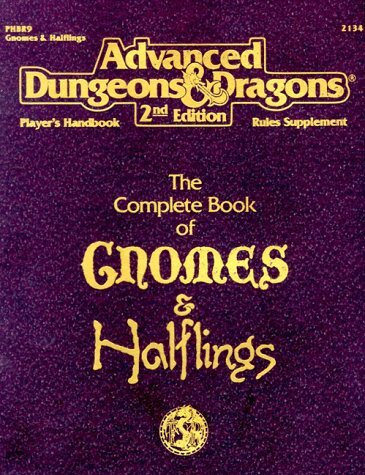 All of that is true, yet I love the Complete Book of Gnomes and Halflings more than any other book in the Complete Book Of series. While it seems outdated now, I prefer the Kit system from 2nd Edition to the multi-classing and Feats and the such of later editions. For those who missed 2nd Edition, Kits were class variations that added additional class requirements in exchange for additional skills and abilities. In essence, they were like Level 1 Prestige classes. I liked Kits because they allowed the player to tailor their character without spending three hours creating a character. There are two kits in CBoGaH that made me rate this book so highly. For the gnomes, it is the Rocktender. Demi-human clerics and priests have always been a strange thing to me. I could not wrap my head around it until I read this priest kit. Basically, a Rocktender is a gnome priest who, instead of worshipping the deities of the rocks and earth, worships the rocks and earth itself. This distinction, which makes the gnome a sort of cave-dwelling druid of the stone makes infinitely more sense to me than a medieval style crusader who happens to be very short. The halfling kit that changed my mind about the whole of halfling kind is the Sheriff. Thanks to Robin Hood, the title of Sheriff has a negative connotation to me, but the Halfling Sheriff is a different breed. While the Sheriff is a Fighter, he is a benevolent one, who uses his Charisma more than his Strength. In contrast to the traditional Halfling and Fighter, the Sheriff is a special type of character. Yes, he is basically a very short Andy Griffith, but that makes him a particularly interesting character in the violent worlds of D&D. The real amazing thing is that this slim 128 page book has so much goodness in it. There is an analysis of both cultures and their unique mythologies. Heck, there are six sub-races of halflings. Six! While the utility of this book is sadly reduced if you aren’t playing 2nd Edition, if you like the smallest of the demi-humans, this book is definitely worth picking up.